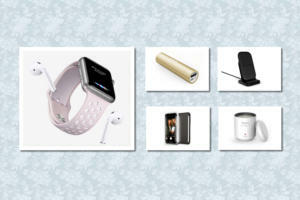 The Week in iOS Accessories: Drink (or not) and be merry! This week's roundup of iOS accessories includes devices that help you track your drinking: One tells you if you're drinking too much, the other if you need to drink more. We've also got speakers and cables and docks and batteries...the usual mix. Drink (or not) and be merry! 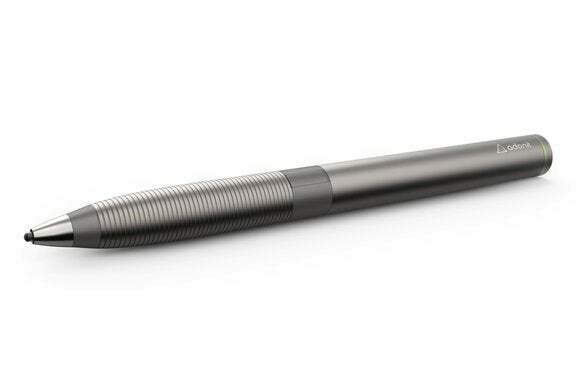 This company’s latest stylus offering takes writing seriously: Instead of the standard “fat nib” you find on most capacitative styluses, the $75 Jot Script Evernote Edition uses a 1.9mm, fine-point, “Pixelpoint” (Adonit’s name) tip designed specifically for handwriting—in a pen-like stylus designed specifically to feel like a ball-point pen. If you’ve got a Bluetooth 4-equipped device, the stylus communicates directly with Jot-enabled apps to enable palm rejection and other nifty features. The company says the new stylus should ship in four to six weeks, though it's taking preorders now. 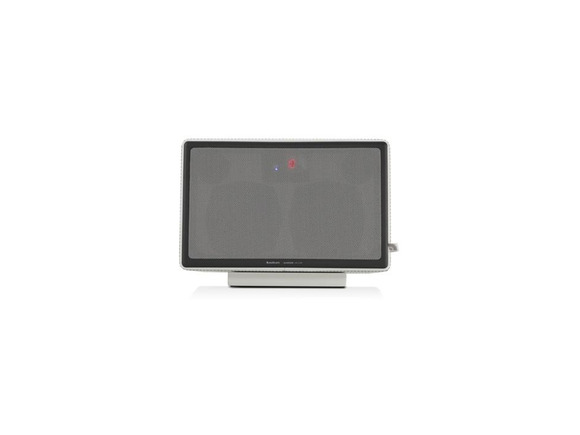 The $800 Allroom Air One is an AirPlay-enabled wireless speaker system capable of putting out 100 watts of sound through two 1-inch tweeters and two 4.5-inch woofers. 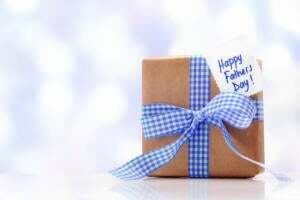 The entire package is wrapped in hand-stitched leather to fit in anywhere in the house. 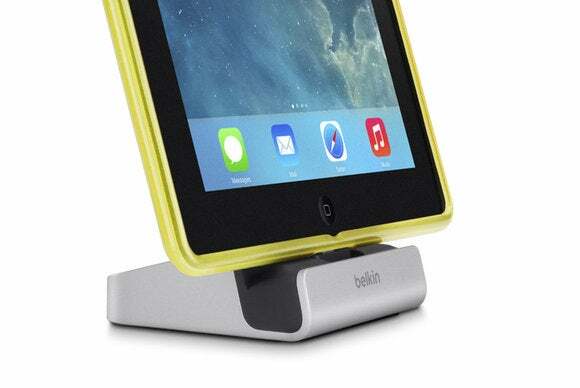 The descriptively named Express Dock for iPad with built-in 4-foot USB cable ($60) is Belkin’s third Lightning-connector charge/sync dock, but this one comes with a clever and unique feature: A dial in the back lets you adjust the height of the dock’s Lightning-connector plug relative to the cradle, allowing you to use the dock with either a bare iPad, iPhone, or iPod, or one in a thin or thick case. 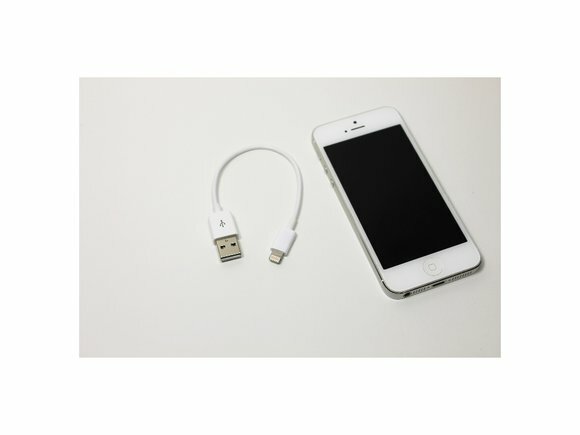 A built-in USB cable lets you connect the dock to your computer to sync and charge your devices, or to a USB power adapter to charge. The $10 Rolio converts your iPhone’s charger and Lightning-to-USB cable into a stable wall dock with no messy cable clutter. 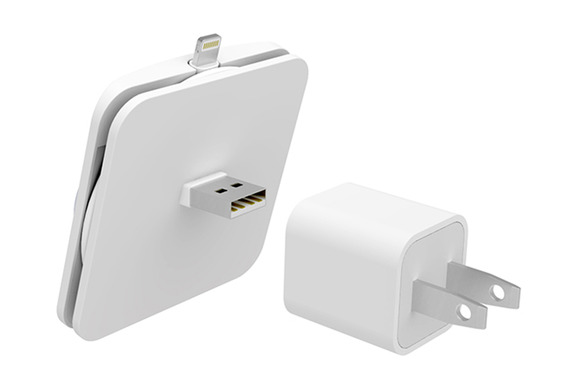 The Rolio provides a spool for the cable, which protrudes out the top of the Rolio to give you a platform on which to dock your iPhone; the cable’s USB plug fits neatly through the center of the Rolio to connect it to the charger. 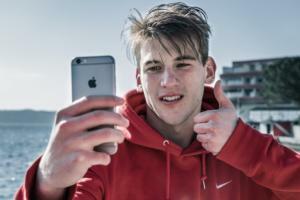 Now your iPhone can tell you if you’re drinking enough water. 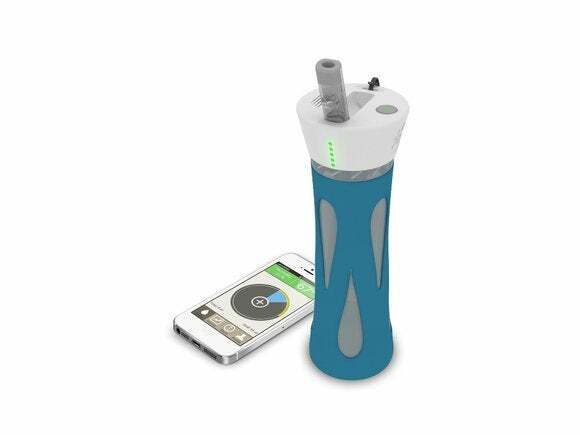 The BluFit system places a monitor on your water bottle and transmits how much you drink to your iPhone, thus helping you figure out if you’re getting enough hydration. The product is still at the funding stage at Indiegogo, where a $54 pledge by early November will earn you the right to a BluFit system; the system is currently expected to begin shipping in March. Want to make sure you’re sober enough to drive? 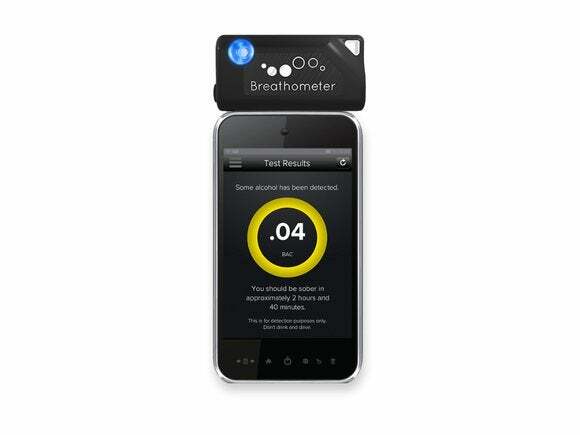 Just blow into the $50 Breathometer, which attaches to your iPhone, and check the readout on your phone’s screen to see whether your blood-alcohol content is within legal limits. (If you have to ask, you’re probably not safe; this tool will simply prove it to you.) The Breathometer is expected to ship this fall. These masters of cable offer two new products: The $25 iBoltz XL is a six-foot charging and syncing USB-to-Lightning cable; the $19 iBlotz XS (pictured) is the same thing, but only five inches long. The $110 IonBank 10k is a 10,000mAh, lithium-polymer battery pack that provides 7 to 8 hours of additional use time for tablets, or multiple full charges for smartphones, according to the company. The aluminum housing is designed for durability, and dual USB-power ports, offering a combined 18W of juice, let you charge two tablets at once. 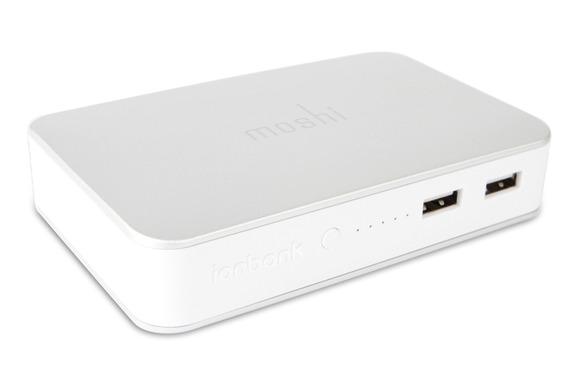 The IonBank features a sliding cover—much like the one on Moshi’s Cardette USB memory-card reader—that hides a convenient storage area for the built-in USB cable you use to charge the IonBank’s own battery. The package includes a cloth carrying pouch. 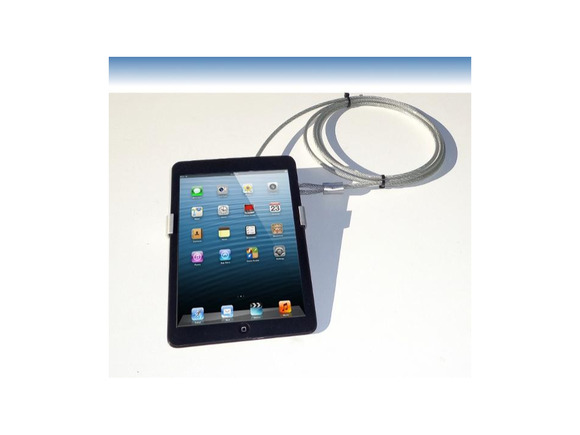 The 40 iPad Mini Lock & Cable Kit, like many products from NewMacGadgets, is designed for showroom floors, rather than consumer use: The cable lets you secure an iPad mini so that customers can use the tablet without running off with it. The company says it’s perfect for “trade-shows, retail stores, counter-top displays, conferences and exhibits, libraries, schools” and more. The $13 Keyprop plugs into your iPhone’s Lightning port to act as a kickstand for viewing the phone hands-free in landscape orientation. 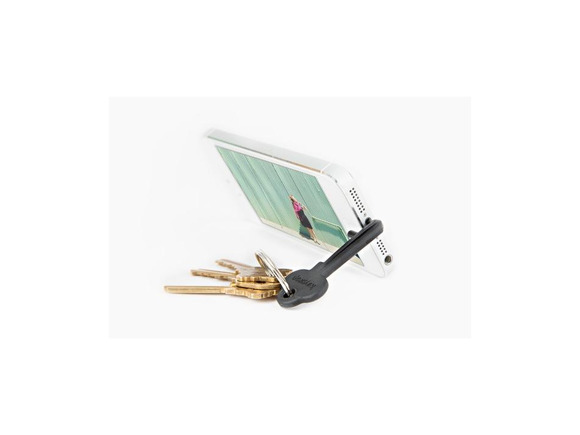 When you’re not using it, it fits right in with the keys on your keyring. 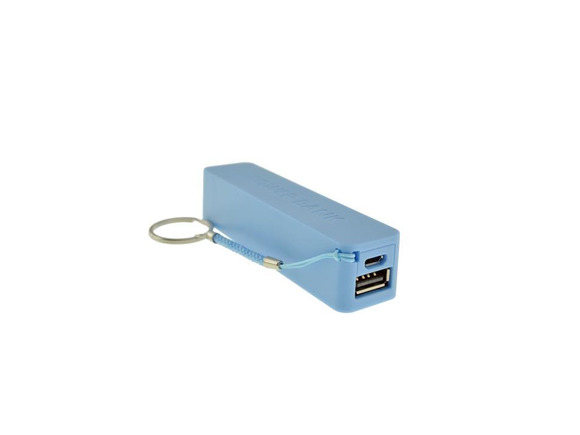 The $10 Power Bank slides easily into pocket and provides 1,900 mAh of power to juice up your iPhone or other USB-charged device.